Destro has always been my favorite Joe villain. In the Sunbow series, Cobra Commander always came off as kind of a buffoon, but Destro managed to maintain at least a slight air of menace in his portrayal. It seems regardless of the medium, even if it’s panned by the Joe community, Destro seems to come off pretty well. This was no truer than it was in Rise of Cobra. I thought the movie was fun, but even I will admit that it had its problems. However, nowhere on that list would you find Destro as played by Christopher Eccleston. 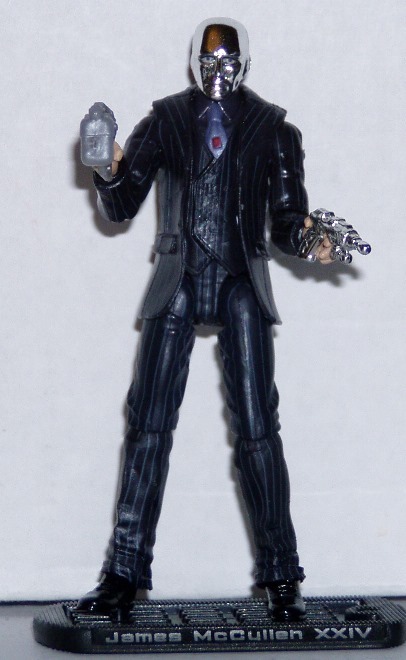 The massmarket Destro figure was loosely based on the movie’s design, but if you wanted a true-to-thefilm Rise of Cobra Destro figure, you had to wait for Comic Con (or in my case Joe Con). Being a con exclusive figure did make James McCullen Destro XXIV a bit harder to find, but Hasbro did an excellent job with him and I’m very pleased that there were enough left over from San Diego Comic Con that the GIJCC could also sell them at Joe Con Kansas City. Going into Rise of Cobra, a friend of mine introduced me to the new version of Doctor Who. Having seen Eccleston as The Doctor, to say I was excited about his casting as Destro was an understatement. I was rather disappointed to learn that the standard Rise of Cobra figure wasn’t really going to look like how Destro appeared in a majority of the movie. 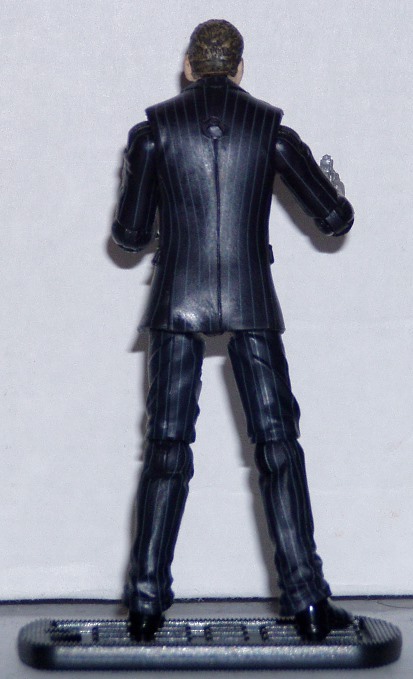 Then, learning that the Eccleston Destro was a Comic Con exclusive meant I pretty much wrote the figure off. I’m glad Joe Con had them because it’s a great figure. Destro uses an entirely new sculpt (though interestingly enough, Hasbro has reused it to make Professor X for the Marvel Universe line) and it’s a great figure. Destro is dressed as he is through basically the entire film, in a dark blue pinstriped suit. On the pegs this wouldn’t be a very exciting figure, so I totally understand why Hasbro didn’t go this route for the carded Rise of Cobra Destro figure. The detailing is quite sharp and the wrinkles look quite natural. 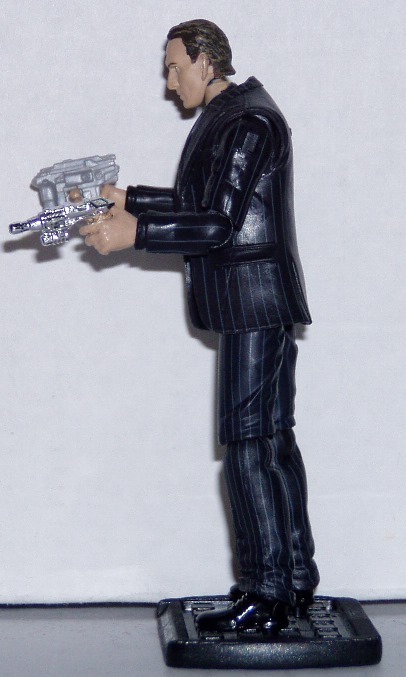 Destro is wearing a three-piece suit and that unfortunately does make his upper body a little bulky. 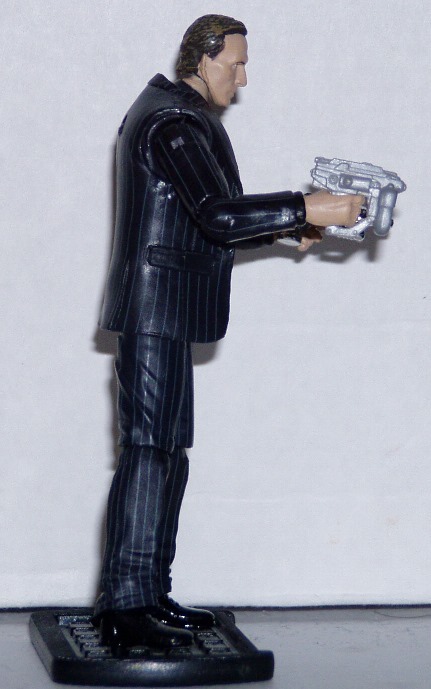 Both the vest and suit jacket are added on pieces, which is quite impressive, but does make him look a bit top heavy. The arms also wind up looking just a little off because his torso is so heavy. I think they needed to make the arms look a little larger (like what they did with the Rise of Cobra Ice Viper’s legs) to make him look a little more proportional. His hands also have an unfortunate problem with holding his accessories. That’s the reason you don’t seem him with his other weapons in my photos. I just couldn’t get him to hold them well enough for me to get a picture with them. It’s a shame, but the two accessories in his hands look the most at home there anyway, so it’s not as big a deal as it would be if he couldn’t hold something that just screamed Destro. Underneath the vest and suit jacket, Destro is wearing a purple shirt with a final add on, his tie. I was quite impressed when I saw that the tie was a sculpted on piece rather than just paint. I wish the GIJCC could have used this torso instead of the 25th Cobra Trooper’s when they made Dr. Venom. I think it would have looked a lot better. The tie also works as a nice reference to the original Destro. Since Rise of Cobra was more realistic, the tie pin makes a nice stand in for Destro’s old-school disco medallion which would just look out of place in the real world anymore. Finally, Destro has two different heads. James McCullen XXIV spends most of Rise of Cobra with a regular face. Hasbro did a great job of capturing Christopher Eccleston’s likeness with this head sculpt. I’m glad Hasbro was able to this successfully on an exclusive figure considering they had some problems making getting good likenesses on some of the mass market figures. His second head is your more traditional Destro head sculpt, a shiny, masked (or in Rise of Cobra’s case—encased in nanomites) head. While the Eccleston likeness is understandably not as strong, I can still see Eccleston in his eyes. That’s all I need to make it a successful translation in my mind. Christopher Eccleston has a very distinct face and the silver Destro face obscured it in the few scenes where he had it in the film, but you could still see Eccleston in the staring eyes behind the mask. Hasbro could have just recycled a standard Destro head and no one probably would have cared, but I’m glad they went the extra mile to still capture some Eccleston-y goodness here. A figure that’s just a guy in a suit can be kind of boring. Thankfully, Hasbro did a very good job at painting up Destro so he’s still rather eye-catching. Most of Destro’s colors come from the plastic he’s molded in, but the painted details are quite impressive. First and foremost, his suit is pinstriped. That’s a rather difficult look to pull off in such a small scale, but the paint team pulled it off very well. Having worn a pinstripe suit for many years, the placement is spot on and they look realistic. They could have just done pinstriping fast and dirty, just making them run straight up and down, but they went the extra mile and had them follow the suit’s contours and lines, just like they would in real life. The other real paint application on the suit comes from Destro’s tie pin. The placement is spot on, which is good because if it were off kilter it would kind have hurt the look of the figure. Unfortunately, not everything is perfect in the paint department. The flesh tone paint seems a bit heavy. I kind of wish Destro’s head and hands could have been sculpted in flesh-colored plastic. I think some details in his face sculpt get lost because the coat of paint is just a little too heavy. Plus, I think his hair color is a touch off. To me, Eccleston’s hair looks to be black (or maybe very dark brown) with a bit of salt and pepper going on. However, Destro’s hair is brown with tan highlights. It’s not bad from a distance, but when the figure is sitting right in front of you, it seems his hair is just a bit too light. It’s a bit of a shame most of the paint flaws are on the head sculpt, but really, they’re not really make-or break territory, though I do wish the paint had been a little better on his head sculpt. Destro also comes with a surprising amount of gear and they really went the extra mile to make it look cool. Everything but his nanomite injector and the M.A.R.S. Industries briefcase get the same vac-metal treatment as Destro’s head. I’ve always liked vac-metalized pieces and aside from Super Trooper, you don’t see it that much on Joe accessories. Destro carries the same M.A.R.S. briefcase that the 25th Anniversary did. It’s a nice nod to the original Destro and I do love the removable machine pistol that fits in there. For heavy firepower, Destro has two vac-metalized large pulse rifles. A similar mold (sans the vac-metal) was used with the carded Rise of Cobra Destro, but that mold lacked the handle across the top and could be broken down into two pieces. Destro also comes with the requisite nanomite injector that anyone with a scientific background in the movie had. It’s a nice little piece, though it’s not really my favorite. It looks okay in his hands, but it’s definitely the twitchier of the two accessories to get him to hold. His final accessory is a vac-metalized pulse pistol. I really like this accessory. It seems very Destro. In the movie, Destro really didn’t get his hands dirty all that much, but he did still carry a pulse pistol with him in case he needed to fight back. The mold is great already and it looks pretty sharp in shiny silver. I’ve got to say, I love that Destro’s getting a bit back to his pimpin’ roots. Anyone can have a pulse rifle or a pulse pistol, but to have a chromed one is stylish. Destro’s about style and substance and looks pretty awesome with his vac-metal weapons, though I don’t know how well they’ll hold up over the years. I know I’ve heard people complain about vac-metalized parts breaking down before, but who knows if the technology involved in that—like it has in toy-making across the board—has improved enough to prevent the deterioration you can sometimes see in those pieces. Destro is a great figure, but I kind of wish he’d been a mass market release. My theory about convention exclusives is that it should be a character that’s got a following, but at the same time isn’t one that a collection feels incomplete without it. Jinx is a perfect example of this. The red Jinx is a classic look, but since they did do a standard release based on her movie look, I don’t feel that it leaves a collection of figures incomplete without it. If you’re just looking for a version of Jinx, you could (in theory) find her at the store. Plus, turning the movie Jinx into a red Jinx is just a simple matter of repainting her. 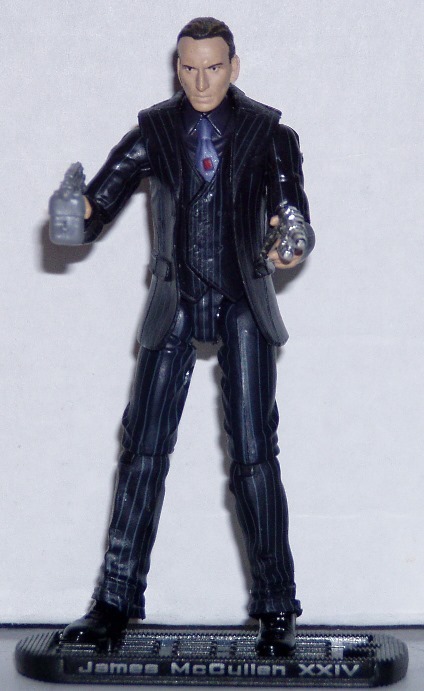 However, making the movie-accurate Rise of Cobra Destro a convention-only figure is kind of a shame. Destro’s a major player in the film and it seems like a bad call to make the only way to get him be through a convention. Let’s be fair, they got a good, movie-accurate Cobra Commander in the first wave, but the truer to the film Rex “The Doctor” Lewis also saw wide release thanks to a later wave. I wish suited Destro could have gotten a similar treatment just because it would have been nice for more people to have the opportunity to get a true to the film Destro. I like the carded Rise of Cobra Destro, it was the first Rise of Cobra figure I bought, but it’s still not as good a figure as the Comic Con Destro in terms of film accuracy. Rex Lewis wasn’t exactly that toy-friendly of a character, but he still got a later-wave release. Why not do the same with suited James McCullen Destro XXIV? Regardless, I’m glad I was able to add him to my collection. He’s easily my favorite Rise of Cobra figure. In fact, he’s the only Rise of Cobra figure that’s currently on display in my collection. That’s a testament to two things: It’s a great figure in and of itself and it’s a great representation of Destro from Rise of Cobra. I’ve got two Destros on display in my very limited case and there aren’t a lot of figures that get that treatment. Rise of Cobra might not have done a lot of things right, but casting Christopher Eccelston as Destro was one of the few things they did. Hasbro turned him into a solid action figure and it’s great to see a smaller version of the Ninth Doctor staring at me from my Joe shelf. I believe this figure was the basis for the new Convention 3 3/4″ Joe Colton. Now with this newer “business suit” mold to replace the Headman outfit, maybe we can get some new dress uniform figures, like General Flagg. Maybe a dress uniform Hawk? And just for the record, I thought Destro was one of the issues with Rise of Cobra. I usually like the actor, but I found the movie Destro to be bland and unintimidating. Though I do think the actor could play a pretty good Destro with some different writing. I actully cant watch the Eccelston Doctor who episodes as Billy Piper really gets up my nose. But getting back to the figure. Figures in buisness suits seem to be a bit of a hard sell. It’s a pity though because they are usually good figures and they offer something else apart from uniforms and fatigues. It’s not really a bad looking figure, but it does look somewhat strange, especially with the hunching forward aspect. As a kid, I had trouble locating a lot of the big name characters in the toy aisles (the Dukes, Cobra Commanders, Flints, ect.). I came close to picking up the Destro figure with the Despoiler, but was prevented from doing so at the time. Destro is debatably my favorite villain from G.I. Joe, so thank God I was able to get the early ’90s version as soon as I saw it on the shelves. I’ve not yet been able to score this figure so I echo your sentiments Rob on wishing it had had a broader release. Being a Brit, the thing I liked about the movie Destro is that he finally had a Scottish accent!